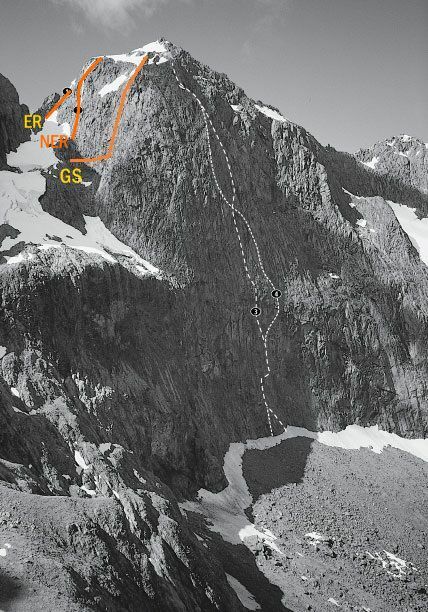 Although the ridges are straightforward, the North Face was something of a breakthrough for New Zealand climbing in 1973, due to the level of commitment and its unprotectable nature. The Marian side of the Col has been descended; eight abseils, not recommended. Starting from the summit of Barrier Peak the blocky ridge continues over to Marian: very exposed but easy travel. A pleasant rock ridge from the Marian Sabre Col. The route may require a short abseil on the descent but it can be down climbed. Mike Gill, Phil Houghton, Jan 1959. At the head of the snow-field, four pitches up a clean rock rib to the summit ridge. Graham Clendon, Murray Judge, Nov 1972. Starting from the level section of central spur (the Sabre Marian gully central spur), traverse two sketchy pitches over to start of obvious buttress (pitons useful). Traversing to here avoids the hideously vegetated terrain below and takes you straight to the real climbing. Climb four pitches up buttress on good rock. Mixture of broken slabs and corners with cracks. Good gear. Rock gets better the higher you go (crux 18). Terrain then eases to scramble to summit. Originally accessed from Marian Peak.